I hope you all have had an enjoyable holiday season. Here we are again entering a New Year with a new clean canvas to continue our stories on. If you are like me, you are probably making resolutions that have usually failed by the second or third week of the new year. I would like to challenge you all to taking a different approach this year. Take a positive approach instead of things you want to fix, make a list of things to look forward to in 2019. Maybe you would like to plan a mini-vacation to explore the Nashville, Kentucky area when you attend the National WOC conference, June 23 – 26. While you are at conference break away from the pack of people you know and make it your mission to meet and get to know at least 2 other individuals attending the conference. If the National conference is too far a stretch for you, then consider the Regional MAR conference that will be held in the beautiful Hunt Valley area north of Baltimore, October 11 & 12, 2019. Another idea might be rebooting an area of your professional life. Have you challenged yourself to share your thoughts and ideas on the WOCN Society’s blogging site? Are you making efforts to attend at least one to two meetings at your local affiliate’s? Have you thought about running for an office at your affiliate or at the regional level? Reach out to whoever is in the position now and work with them to get a better opportunity to understand what circumstances are involved. Did you make some strides in your area of practice that would be great to share? Try making a poster or writing an article. We have so many talented people in our region, that there are plenty of people that you can reach out to for support. Lastly, another idea might be to select one word to guide you throughout this coming year. Some ideas might be: excitement, joy, fun, action, simplify and the like. We are the caregivers and often forget ourselves. So, I challenge you to decide what gives you joy in your personal life and professional life and focus on how you can incorporate that into your daily life. I look forward to working with all of you in this coming year. Please feel free to contact me with any thoughts, ideas on how we can make the MAR website, activities, etc. more meaningful for you. All the best! New MAR Board Officers were installed at the conference for the 2019-2021 term. Joanne Biddix, from the Central Virginia Affiliate, will serve another term as Member at Large for Communications. 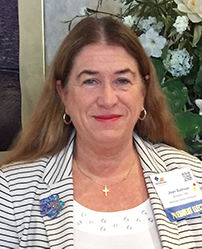 Ferne Elsass, from the Hampton Roads Affiliate, will serve another term as Secretary. Joan Sullivan moves from President-Elect to President as Lisa Owens vacates that seat. Thank you so much, Lisa, for all your hard work and dedication to the region over the years!! Thank you for all your years of service on the MAR Board. Information and application for 2019 scholarships is now available on our Scholarships Page. Applications and supporting documents are due no later than August 31, 2019. Go to Scholarship Page. 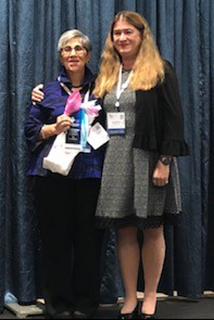 Because of the awareness of the growing need for wound, ostomy and continence (WOC) nurses throughout the world and a strong belief in the continued growth and success of WOC nursing, Mid Atlantic Region of the Wound, Ostomy and Continence Nurses Society (WOCN) has established a program to award educational scholarships. The partial scholarships are made possible through contributions from the Mid Atlantic Region of the WOCN. The MAR of the WOCN® Society Scholarship Committee is a standing committee of the Mid Atlantic Region. The scholarship program is operated under the auspices of the Mid Atlantic Region of the WOCN, which raises, maintains and disseminates monies and is accountable for the funding of awards. Scholarships are awarded to deserving individuals who are committed to working in the specialty practice of wound, ostomy, or continence nursing. Applicants agree to support the WOCN Society's mission and the scope of practice for WOC nursing. If you have any news to share, please use the contact form for either Joanne Biddix, Director of Communications, or for your specific affiliate. Will you be joining us in Nashville for WOCNext 2019 ? After scheduled educational activities, get to know the heart of the city and experience all that Nashville has to offer! Wound, ostomy and continence (WOC) nursing is a multifaceted, evidence based practice incorporating a unique body of knowledge to provide excellence in prevention, health maintenance, therapeutic intervention, and rehabilitative nursing care to persons with select disorders of the gastrointestinal, genitourinary and integument systems. This complex, interdependent specialty encompasses the care of all patient populations across the continuum of care while providing a pivotal role as educator, researcher and resource throughout the healthcare community. WOC nursing directs its efforts at improving the quality of life for individuals with wound, ostomy and continence concerns. © MAR WOCN All Rights Reserved - . Page updated 04/13/2019.